This evening I attended my very first wine tasting at a local bar/café/coffee shop. I enjoy drinking wine regularly, but I had no idea what to expect at an actual tasting. Before tonight, I had limited knowledge of the process: the “nose,” the swirling…I just based my likes and dislikes on pure taste. 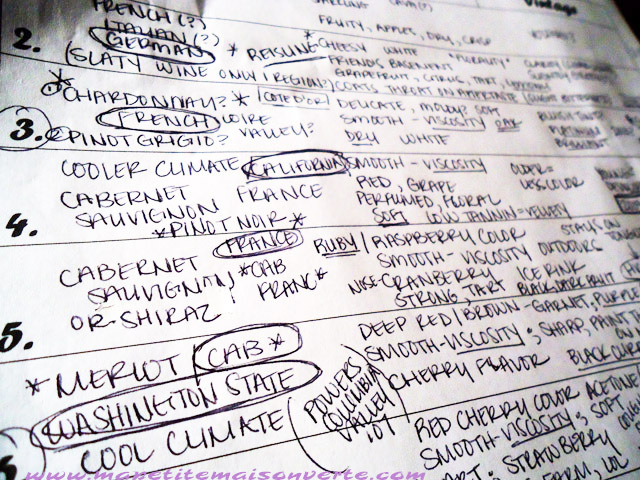 I began a wine journal this summer, because I often forget the names of wines I enjoy. This is especially true when I am at the store with a whole array of bottles in front of me. I am sure that there are things a person “should” write in a wine journal, but I generally make note of: the date I drank it, the company (who was there), the winery, the year it was bottled, the price, the food served with it, and the taste of it, in addition to the type of wine, of course! I usually only write down the wines that I like. I’m sure that some wine connoisseurs think that it’s a good idea to write down both the good and the bad, but I figure that a bad wine isn’t worth remembering or taking up a page in my journal. I have learned through years of drinking exploring wines that I don’t care much for Pinot Grigio, Rosé, or Malbec. I will try anything, but I generally don’t buy these types of wine. I have come to realize that I prefer sweeter, crisper white wines like Riesling, Chardonnay, and Moscato, and rich, smooth red wines like Cabernet Sauvignon and Merlot. I sampled a total of seven different wines paired with cheeses, hummus, and a balsamic tomato crostini. We were given two white wines, a sparkling Rosé, and four red wines. Out of the seven wines, I liked the taste of four. I guess that is pretty good considering it was my first tasting? The wines I liked best were: a French Côte d’Or Chardonnay, A Cabernet from Washington State, a Pinot Noir from California, and a Barbaresco from Italy. Hmmm, I’m thinking that would be the perfect celebration for my next birthday!